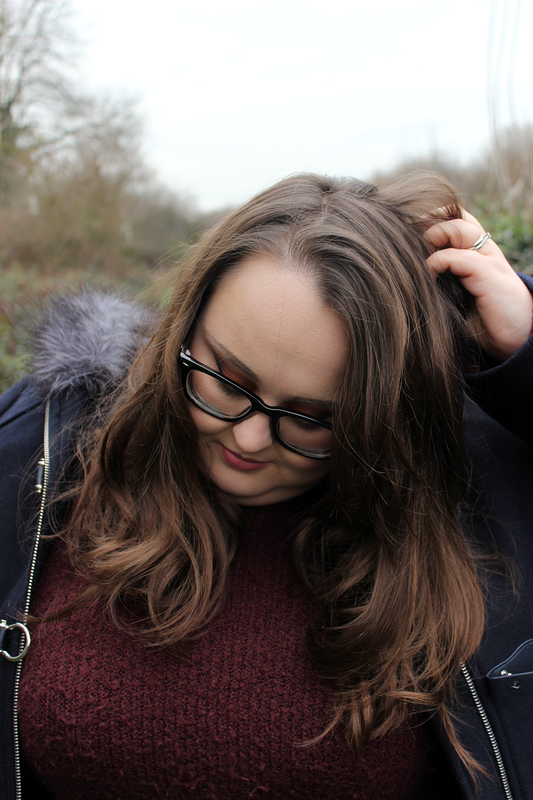 I may be a little late to the party but along with every other blogger out there, I’m damn nosy when it comes to finding out what people got for Christmas. Gone are the days of posting up swag on Facebook for my friends and I because these days it’s all about what the children get, not yourself. This was what the season was all about for Rick and I as we had my step-daughter for the week of Christmas and then New Year to ourselves – but I was so busy working I hardly had time to catch my breath. I didn’t get masses this year and with a wedding around the corner we told our friends and family not to bother spending anything on us and just sending H. Samuel gift cards if they wished to pay off our wedding rings. Fine for family, not so fine for Rick who still managed to spoil me regardless. 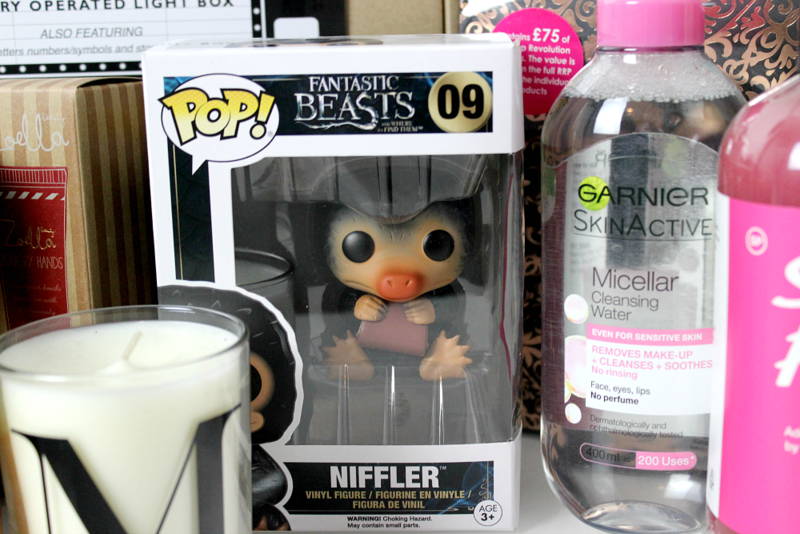 A few weeks ago we went to the cinema to watch Fantastic Beasts and Where to Find Them and I spent about 80% of it gushing over the cute little Niffler. As Kipper developed a taste for Christmas wrapping paper in early December this was one of my gifts I got to open early so I’m now a happy owner of my first ever pop vinyl. We’ve since added Harry and a Dementor to our book shelf collection in the sales and I bet we’ll be adding more as time goes on, I think I’ve finally caught the pop vinyl bug. With the little bit of extra cash I had banging around from my pay before Christmas I treated myself to a few more pieces such as another big bottle of the Garnier Skin Active Micellar Cleansing Water which is my all time favourite beauty product of 2016 – I couldn’t say no. Technically a little gift to myself from Santa. 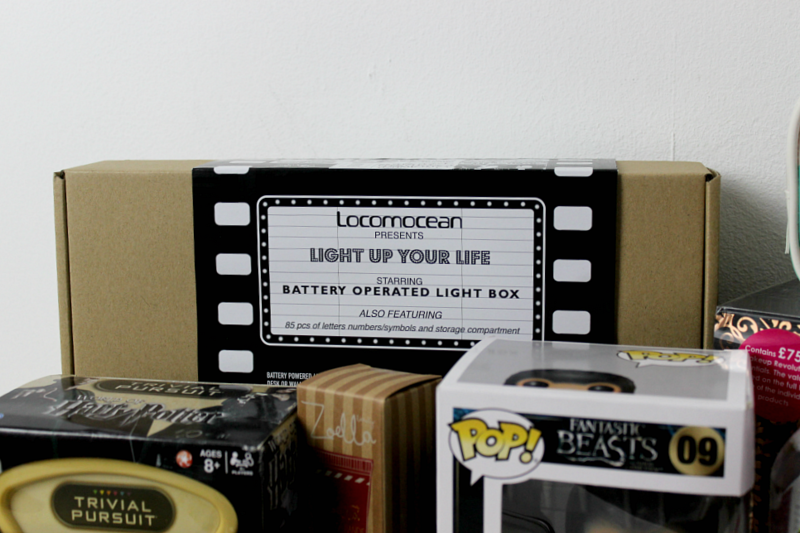 The light-box at the back from Menkind in their January sale but it still counts as a Christmas gift. I had one from New Look in the summer but when I put the back on it the plastic was wonky so I took it back and forgot to get a replacement. As soon as I saw this I knew I had to have it, it’s much bigger and looks great on our bookshelf and for the occasional blog post – I’m sure it will even end up as a prop for the wedding. 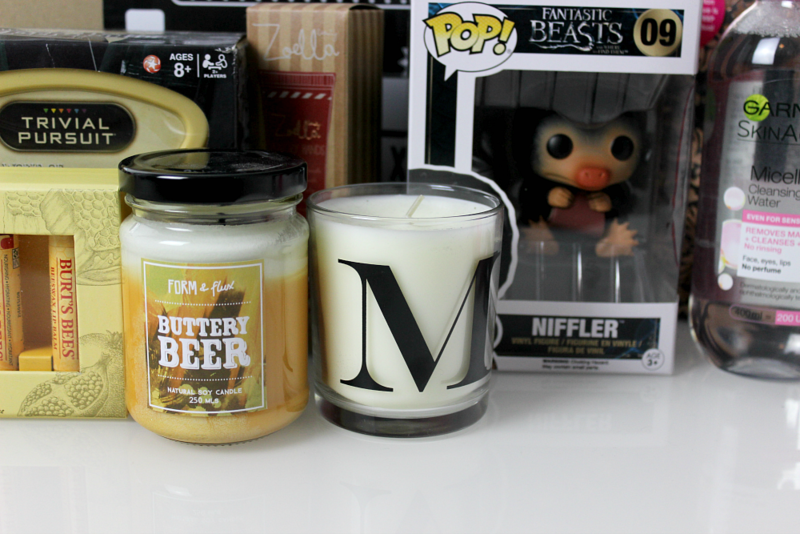 Rick brought me a Buttery Beer candle from Nook and Burrow and I’m in love. I’ve seen these candles around for the longest time and was so surprised when I opened this one because I know how much the shipping alone costs. We’ve had it burning for a little while and it still keeps it’s foamy top when melting which is gorgeous, I really want to add to my collection and try them all especially the Queen of Tarts one! The Harry Potter Trivial Pursuit hiding at the back was a surprise from a family friend so I’m saving it for an evening in with just us to play together, I’ve had this idea about buying a board game to play at Christmas as a new tradition for years so this will be a good starter for that one. Hopefully next year I’ll be working somewhere that won’t be so busy during the festive season and we can enjoy some quality family time together instead. I can always rely on my Mum to rustle up some classic Avon for this time of year. There’s some seriously good bargains in there, even if their gift sets are the standard grandma gift of Christmas, Avon have a really wide selection of affordable make up and cosmetics and I have many of a fond memory of putting in an order to be delivered to the door by a rep when I was a teenager. This Chocolate and Orange Bubble Bath smells friggin’ amazing and I’ve been waiting patiently to try it since I opened the box full of goodies my Mum got me. We love anything bath related as you can tell by how much I was gifted. 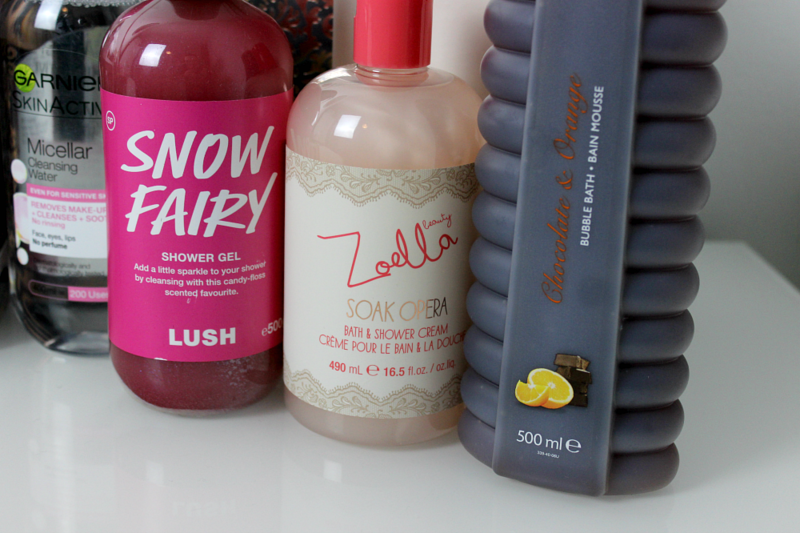 Snow Fairy is always a must this time of year and I’ve no idea how Mum got her hands on a bottle so big but she evened it all out with a bit of Zoella Beauty. 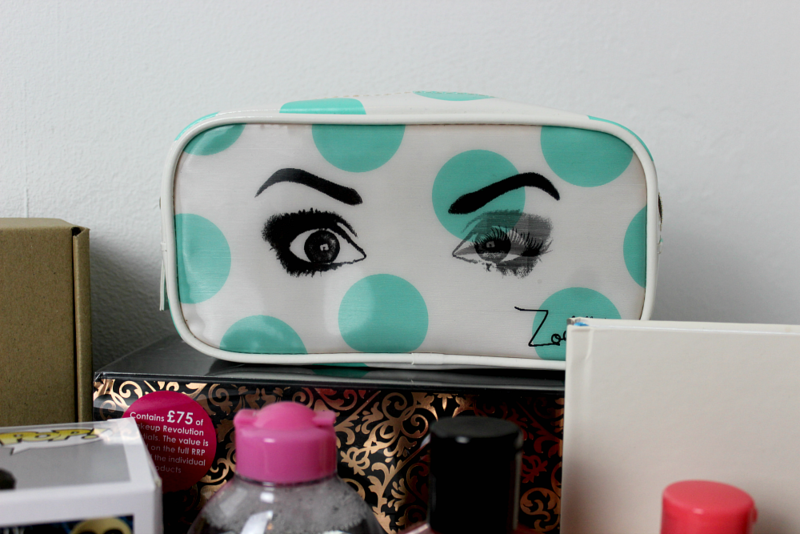 I’ve never tried Zoella’s products before and must say, I’m quite impressed. I’ve used the Hungry Hands Cream for the first time this evening and it dried up so quickly without leaving my hands still greasy I could not get over it. Hidden at the very back is a little gift to myself in the form of the Feel Unique Beauty Diary for 2017 which I read about on Gemma’s blog here. I got this a little late and grabbed a 50% off bargain with my first ever order from Feel Unique and so far I’m loving it. I use Google Calendar for a lot of my daily appointments because I can share that with Rick so we know what we’re both doing but it’s so nice to be able to write down in a physical diary where I’m going and what I’m doing each day – I’ve missed it. Not pictured (because I was using it at the time) is from the lovely Dot Creates and it’s the Ultimate Blog Planner in Grey. I’ve used this repeatedly since opening because it’s so damn useful as I’ve been working on my blog from about three different notebooks since last year – it’s great to have something in my hands that’s catered to exactly what I want it for. I love me some lip balm and did specifically ask for this Burt’s Bees® Burt’s Balms Gift Set just before Christmas and Rick kindly ran out and got me it. My amazing Mum even put another balm in with a goody bag as I gift so I’ve chucked all of my old pots of vaseline I’ve been hoarding for years away as I’m set up for the time being now. I’ve currently using the pear flavoured balm and it’s quite nice on my lips, it makes a welcome change using a pocket-warm wax instead of greasy vaseline during the day. My main gift from Rick was the Make Up Revolution 12 Days of Christmas Storage Chest and my word, does it feel luxurious. After removing all of the swish packaging I’ve used the box as a place to put all of my eye and face palettes I don’t have the room for in my main make up stash and it looks lovely. I’ll be posting a thorough review about the chest another time so watch this space! What did you get for Christmas this year? Anything exciting or unexpected? Let me know in the comments.